We’d love your help. 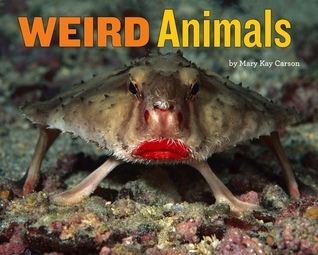 Let us know what’s wrong with this preview of Weird Animals by Mary Kay Carson. Slime-oozing slugs, red-lipped fish, spine-covered bugs, and tubed-nosed bats. There animals are weird—and AWESOME! But have you ever wondered why they look so strange? Find out! Axolotl, sea pig, mirror spider. These are some crazy-looking critters! But no matter how bizarre or wacky, there’s a reason why animals look the way they do. These characteristics—including the Slime-oozing slugs, red-lipped fish, spine-covered bugs, and tubed-nosed bats. There animals are weird—and AWESOME! But have you ever wondered why they look so strange? Find out! To ask other readers questions about Weird Animals, please sign up. Appealing introduction into "weird animals" for your fact hounds. Well-organized, uncluttered and interesting. Readers are really going to enjoy learning about why these unique animals have such interesting features!